The working of this week’s stitch is on SharonB’s blog. I worked this isolated stitch with other TAST stitches in this sampler. 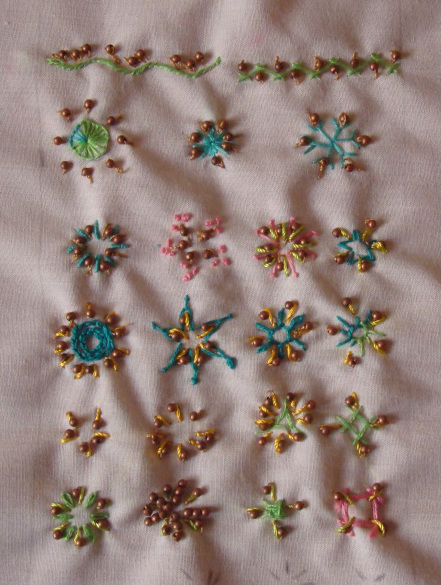 2.The other stitches that form the motifs in the first row are, bullion knots, French knots, pistil stitches and arrowhead stitch worked as a star. 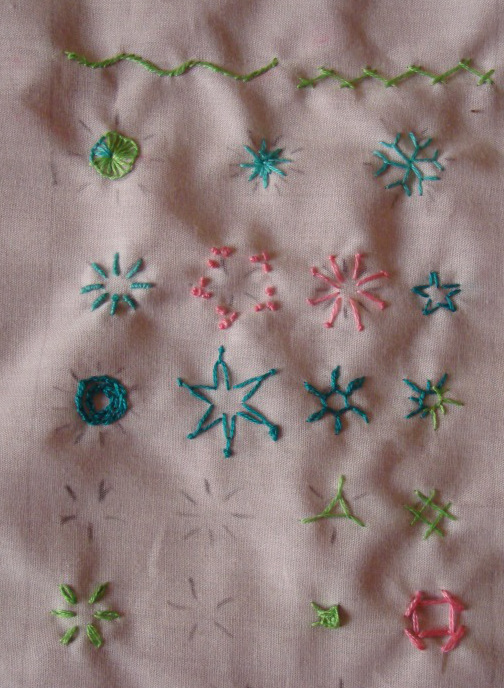 The second row has chain stitch circles, Italian border stitches, basque and buttonhole stitches worked in circles. The twisted satin with beads are worked with these stitches. I prefer to work the satin stitch with tapestry needle and perle cotton or the cone thread and the beads with thinner thread. It is time consuming, but better than trying to insert the bead to a thicker needle. Maybe, after working with # 5 perle cotton I could change my view. For now looking forward to the next week’s stitch and catching up with last week’s twisted satin stitch. The sampler after working picots into other buttonhole stitch variations. 4.Picots are worked along with up and down buttonhole stitch in the first row. Picots are worked top of half buttonhole wheels in the second row. Picots are worked with top knotted buttonhole stitches in the third row. 5. Picots are worked with buttonhole stitches knotted over three stitches in the first row. Sailor stitch and picots are worked alternatively in the second row. Basque stitches and buttonhole picots are worked together in the last row.